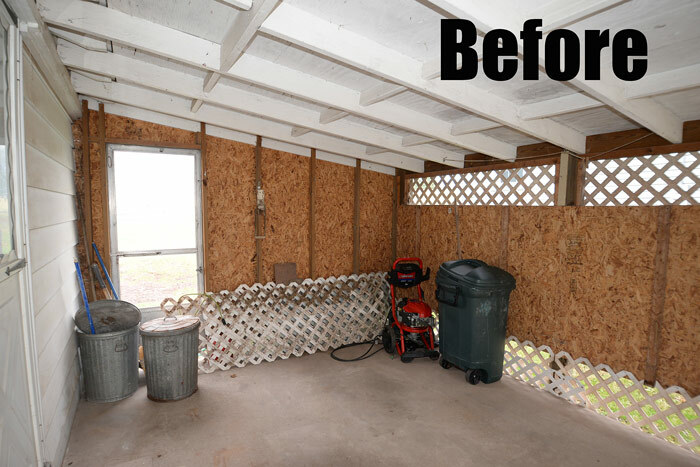 In the meantime, I wanted to take a minute and show you the work I’ve completed in the carport of the flip house. This was one area where I really had to put the squeeze on the budget. In other words, I had to get really creative about what I could do to freshen up the space without changing it structurally or spending a bunch of money. Let’s take a look at the “before,” shall we? I started by emptying out the junk, scrubbing the siding, cleaning up the entrance, and scraping off any loose paint from the ceiling. Then primer and paint became my BFFs for about 4 days. 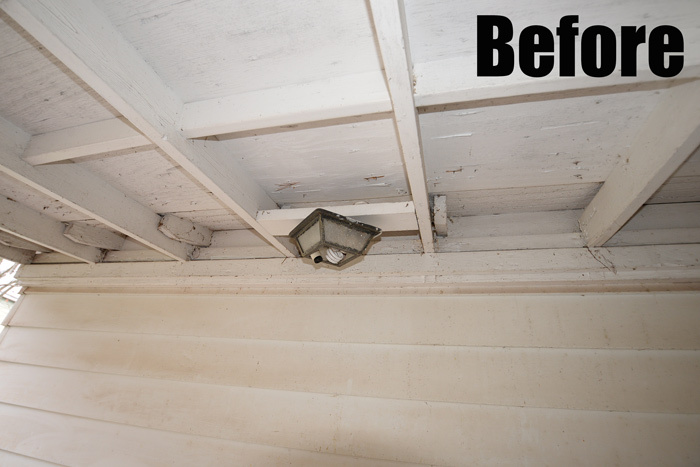 To get good stain coverage on the ceiling and walls, I applied a thick coat of Zinsser® Cover Stain® Oil-Base Primer. When I suspect I may have issues with water stains or wood knots bleeding through the paint, I don’t mess around with anything else to try and hide them. I use this primer to knock out the problem with one coat. Period. In the past, I’ve used water-based primers because, well, I prefer the ease of soap and water cleanup. But there is just no substitute for a good oil or shellac-based primer for hiding stains. Cover Stain is my absolute, hands-down, all-time favorite for this purpose, especially for exterior applications. It’s quite affordable, too, at about $20 a gallon, and it saves work in the end. 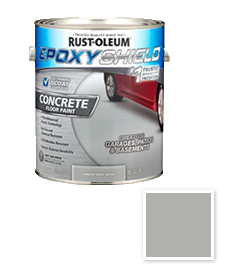 For the floor, I used Rust-Oleum® EPOXYSHIELD® Concrete Floor Paint in Armor Gray Satin. This product goes on smoothly and quickly and I think the color is just gorgeous. I got the entire first coat rolled on in less than an hour. I would definitely recommend when using this product that you have dry weather in the forecast and an ambient temperature above 50 F. I’ve got a few spots to touch up because we got an unexpected rain shower and it kept the paint from adhering properly. Between the white walls and ceiling and the newly painted floor, this space now looks fresh and bright. 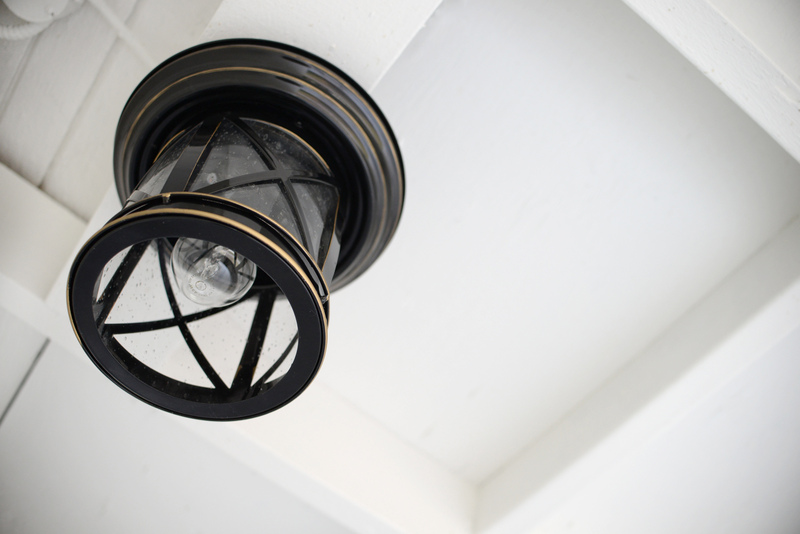 I also removed the broken ceiling light and replaced it with this inexpensive fixture. I think it ties in well with the front porch light. 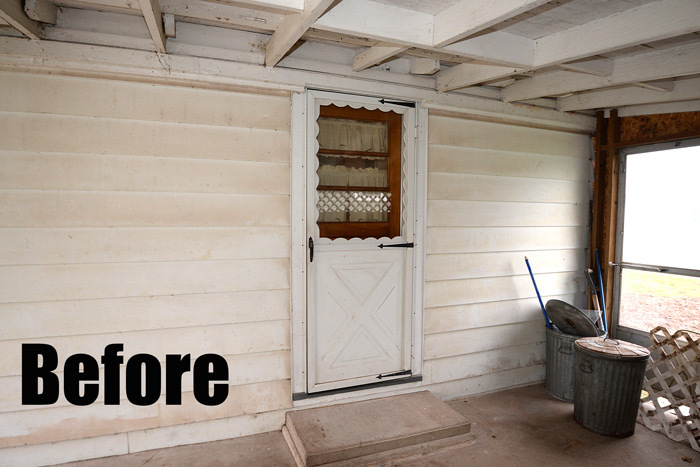 What do you think of this budget-friendly transformation? If you’re curious about what the inside of the house looks like right now, check out this video I made and be sure to enter to win a $50 Duluth Trading Company gift card, too. Later this week, I will be sharing the finished downstairs bathroom. I am so excited because I think it looks amazing! Stay tuned. Special thanks to Rust-Oleum for providing, at my request, the white solid stain and gray floor paint I needed to complete this project. As always, all opinions are 100 percent mine. This entry was posted in Exterior, Flips, Frugal living, Garage and tagged Carport makeover, Rust-Oleum, White garage, Zinsser by Susan. Bookmark the permalink. Looking great!! It is amazing how paint can make such a difference. Could you please let us know where you got the new light fixture? 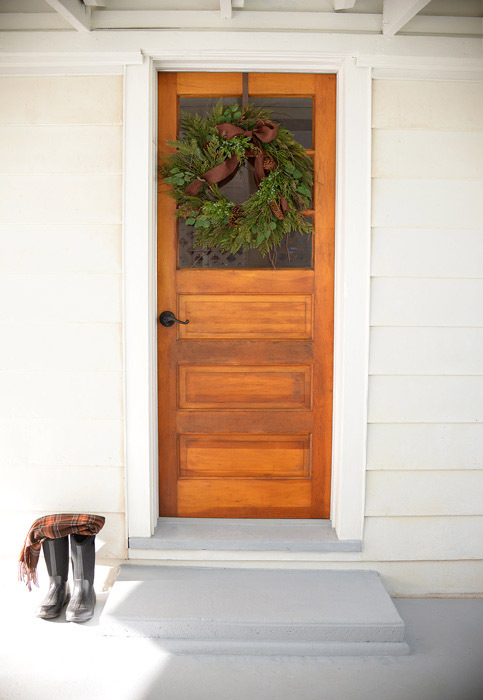 I love it and it may be the right fixture for my front porch. Thanks! Best of luck through the rest of your adventure! Susan, such a difference! Looks beautiful. We’re all out here waiting for each post on your flip. Your work is so inspiring! Your hard work has paid off by priming and painting the area. The transformation is fantastic. I bet you feel vibrant and energized every time you are in this area. Well done! Looks so great! Paint is miraculous!! WOW!!!! What a transformation – you could have a party out there now!!!! A few twinkle lights and a nice table and chairs and it’s all set!! Wow! Love these updates!! You are doing an Awesome job!! Wow, that car port looks amazing. It also proves a point I have been trying to make for years. 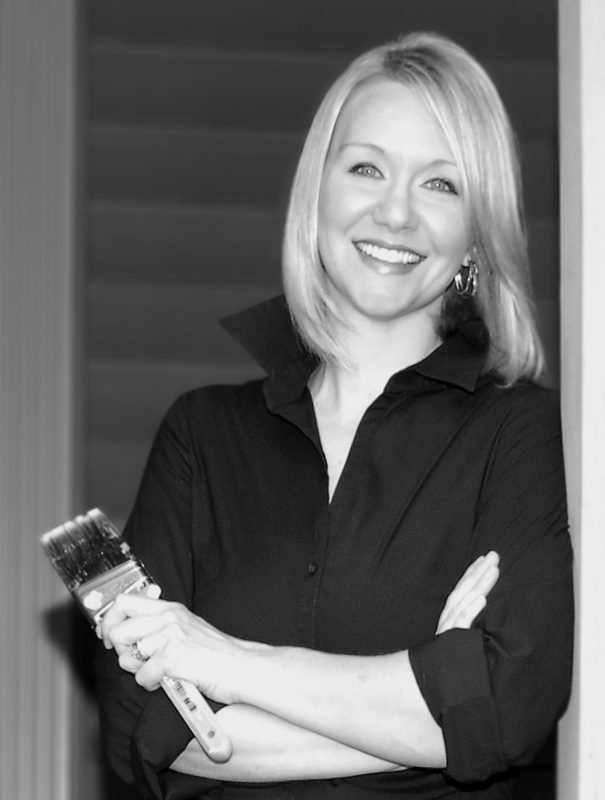 Not everyone can afford to renovate, but a little bit of paint can sure make a room look like it has had some renovation and it will look fresh and clean. Paint is always my first line of defense. Amazing what a lil’ paint can do! Looks great and looooving the light fixture! That looks amazing! Wow! Loving following along with your house flip. 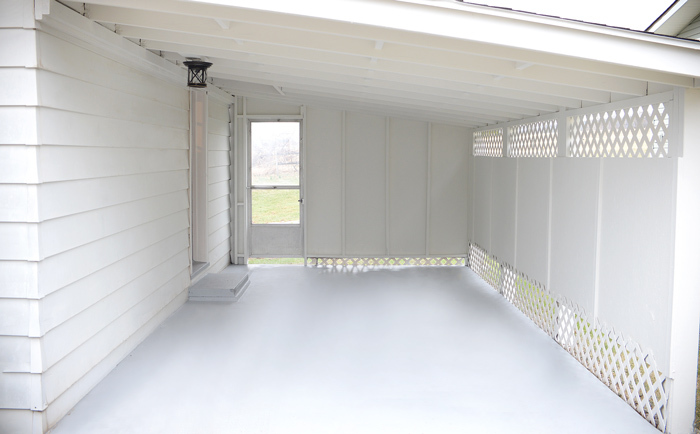 Your carport looks great! I am always amazed at what a coat of paint can do! I am in the process of painting the interior of our garage and hope it turns out half as good as this! Thanks for sharing. Looks good, but I wish you had details the additional wood you added, so we could get a real sense of everything you did and not just the painting.